Are you looking for a social media management tool to save you time? We know that having the right presence on social media is key to the growth and success of your business. For many, a management tool has become an essential part of any social media strategy. Whether you work alone or as part of a team, managing your social media presence requires a tool that will not only schedule ahead, but analyze network engagement too. With Hootsuite’s Auto Scheduling you can maintain a 24/7 presence on social media. Once you have a content schedule, it’s easy to add new posts to fill the gaps. For instance, you can use the Hootlet extension to schedule posts as you surf the net. Or you can upload your content in bulk via a CSV file. However you choose to add your content, you can always see your schedule at a glance either in a list or a calendar with daily, weekly or monthly views. TweetDeck allows users to tweet messages immediately or schedule them for later delivery. If you manage multiple accounts through TweetDeck, you have the option to schedule Tweets for each of them. You can make changes to a scheduled Tweet before it’s published, and you can also add images and GIFs to your message. Sprout Social allows you to schedule, queue and publish messages to each social network from their web app, browser extension, and mobile apps. Sprout’s ViralPost tool determines the best times to post your messages so you can maximize engagement. The user-based publishing permissions let you set up team members to draft and submit messages, and then have team leaders or managers approve them. Using the shared content calendar you can view and manage social posts across multiple profiles, networks, and campaigns. AgoraPulse is a social media scheduling tool to rival Hootsuite. AgoraPulse started as an app for Facebook, and quickly moved into a tool where you can monitor your social media in one place. You can manage, schedule and post your content to Facebook, Twitter, LinkedIn, G+ and Instagram. AgoraPulse lets you schedule your content in advance with a pre-selected date and time. Or you can program your posts to run once every hour/day/week/month. You can also take advantage of the queue function to share your evergreen content again and again. With MavSocial, content is scheduled through campaigns. You can create campaigns across one or many networks and view your schedule in the calendar. From there you can drag-and-drop content to change the publishing dates and times if needed. You can reschedule your content by creating cyclical campaigns. For example, you could have campaigns for blog posts, quotes, promotions, and events. Either add your content once and let it repeat cyclically or create variations by modifying it. 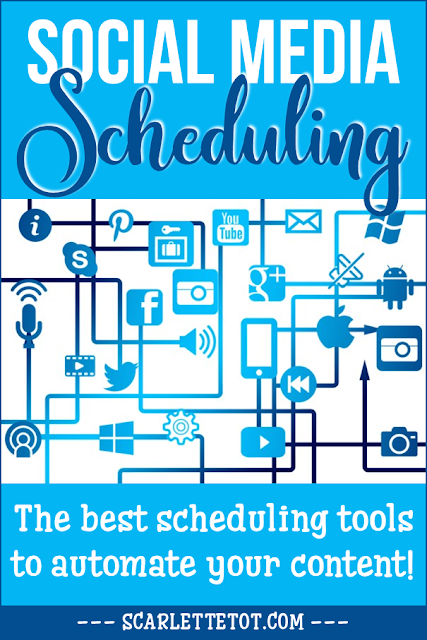 CoSchedule is an all-in-one marketing calendar for your blogging and social media needs. It’s a drag and drop calendar, which makes it easy to adjust things when you need to push back deadlines or change your strategy. It allows you to automate when and how your blog and social media posts will be published. Everything you publish with Edgar is stored in an organized library and arranged into categories, like “Quotes,” “Blog Posts,” or “Cat Puns.” To save even more time, you can add content in bulk or connect him to an RSS feed. Create a schedule that tells Edgar when to publish from each category. That way, he always knows what types of status updates to post at which times, sharing the right variety of content automatically. When Edgar makes his way through all the new content in a category, he’ll simply start recycling older updates. Your library is organized into categories, and your schedule is built around the types of things you want to post. When he’s published everything from a category, Edgar re-shares older updates that people might have missed the first time around. The Unified Social Inbox from eClincher collects all your social media messages and notifications in one place, so you can respond, thank, follow, or engage with your audience. As soon as you log into eClincher, you’ll see how many pending notifications you have. Once you’ve answered a message, it disappears from your list so you can focus on the remaining messages. If you prefer to monitor your social media activities in real-time, then use the Live Social Feeds. Inside you can see each of your connected social media profiles, pages, and groups. From there you can like, comment, and reply, in one place rather than visiting each native platform. Just click the download button to learn how to schedule posts on Facebook and a second handy little tip about content curation that you may not be aware of.